Evan Durning, 18, had never met his grandfather, a legendary adventurer and mystic who fought in WWII, but suddenly has his life turned upside down when the old man passes away and Evan’s father inherits a family farm. The farm is located in the soaring, misty grandeur of the majestic Drakensberg mountains of South Africa, amid breathtaking stone cliffs, vast grey pine forests, and the silence of unspoilt nature. The Drakensberg (“Dragon Mountains”) is a place of elemental power – and a place of discovery. Evan’s new home is Mylestone Manor – an ancient and imposing stone keep built on a grand scale, with far too many rooms, gargoyles on the roof, and a ninety-year-old manservant who seems to think that there is something special about Evan. There, he meets Cat Hardy, a mysterious and gifted young woman, who introduces him to a world of magick, beauty, and primal passion among the mists and forests of the fabled mountains. Evan is drawn into a world of intrigue and power, as together he and Cat uncover a secret hidden for centuries – a secret as timeless as the pyramids themselves. But Evan’s presence also attracts the malignant interest of an ancient enemy: a dark figure who strides through time, the most powerful and evil warlock in Earth’s history. And as the shroud that separates the worlds is torn apart, Evan quickly realizes that there was far more to his grandfather than he could ever have suspected. 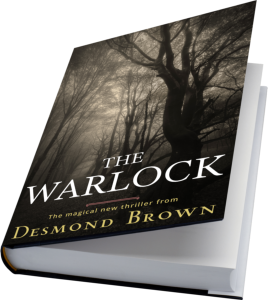 Read the prologue and Chapter One of The Warlock, free, right here. Adam Fossett is a disgraced former Navy Commando, part-time Greenpeace activist, and loner, backpacking through Peru. One evening in a small town, he is introduced to a documentary producer, Samantha Moore, in a very unusual way. They are instantly attracted to each other. She is on her way to film an insert on an extinct indigenous tribe – the Mochica. The tribe, along with their unique language, have disappeared forever, but there is still one remaining member of the Mochica who speaks the language: a wizened, 70-year old Scarlet Macaw, which reputedly boasts an incredibly large vocabulary in the now-unknown tongue. The Macaw, named Esteban, lives in a conservatory deep in the mists and jungles of the Ayacucho Andes – a place of legend and magic – and there is something very unusual about the bird. The Ojo de la Dioses – the Eye of the Gods – is the name of a remote mountain peak in a protected area of the Andes, the place where, according to local legend, the gods descended from the stars to create mankind. It is also, say the local tribes, the hiding place of a treasure so vast that even the gods themselves could not take it with them when they departed. Today, it is at the heart of a notorious drug trafficking route, one of South America’s most feared regions. And Esteban, the Macaw, seems to know something, because he has one simple request, uttered over and over: take me there. Adam and Sam are faced with a choice: ignore Esteban, and a cryptic map they are given by a dying elder, or embark on a high-stakes journey to uncover something that has been hidden from humanity for thousands of years – an ancient secret so staggering that it could change the course of history forever. Read the prologue and Chapter One of Eye of the Gods, free, right here.